Splashes of colour from rātā and pōhutukawa flowers; the spiky forms of nīkau palms; karaka’s orange berries and shiny leaves. These are some of New Zealand’s most distinctive tall broadleaf trees – evergreen flowering trees that make up the forest canopy. New Zealand’s tall broadleaf trees are flowering trees, usually more than 15 metres high. They grow in forests around New Zealand, often with tall conifers (trees that produce cones). New Zealand’s native tall broadleaf trees have close relatives in other countries. Scientists believe that some trees are descended from ancient forests on the Gondwana supercontinent, which New Zealand was part of until 85 million years ago. Other trees may have arrived later, from tropical forests north of New Zealand. Most have small green or white flowers, which are pollinated by insects. Tree rātā, pōhutukawa, pūriri and rewarewa have red flowers, and are pollinated by birds and insects. Native birds are important for spreading the seeds of these trees. They eat the fruit, then excrete the seeds somewhere else, where a new tree may grow. People have cleared large areas of forest, and cut down trees for timber or firewood. Possums, deer and goats harm trees by eating their leaves, twigs and bark. Native birds, which spread seed so new trees can grow, have been killed by introduced mammals. Rats also eat the flowers, fruit and seed. Northern rātā can grow over 40 metres tall. It usually starts growing high up in another tree. Then it sends down roots to the ground. These help feed the plant, and later turn into a trunk. Pōhutukawa mostly grows by the sea. 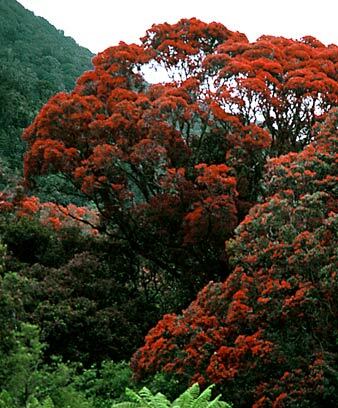 It has beautiful red flowers in December (summer), so it is known as New Zealand’s Christmas tree. Pūriri has pink flowers and berries. The pūriri moth caterpillar digs tunnels in its trunk. Māori sometimes used to put the bones of dead people in the hollow trunks of large pūriri trees. Rewarewa is cone-shaped and very tall – more than 35 metres. You can see them poking up above other trees in the forest. Black maire burns well, so many were cut down for firewood. Karaka has poisonous orange berries, which Māori soaked and baked so they were safe to eat. They planted the trees around New Zealand for food. Nīkau is the world’s most southern palm tree. It has dramatic spiky leaves, up to 3 metres long. Kāmahi is probably New Zealand’s most common tree. Bees make a delicious honey from its nectar.